American biblilcal studies have changed considerably during the lifetime of Terry Fretheim—or better, Professor Fretheim has been one of the positive agents of those changes. 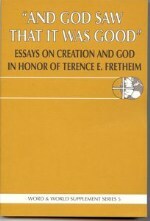 Fretheim's first published essay in 1967 was a technical study of Ps 132 and the Jerusalem cult. Quite a distance from that to the sweeping theological interests that mark his latest book, God and World in the Old Testament! 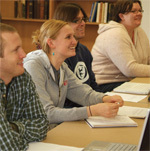 Terry Fretheim's model of reaching out—beyond the questions of an earlier time, beyond the boundaries of his own discipline, beyond the walls of the classroom and the seminary, beyond the internal concerns of the church—while always holding fast to the particular gift that he brings to the conversation, namely, his creative and unflinching engagement with biblical texts, will be one that this and other seminaries need to follow as we move further into this new century. "Ask the animals, and they will teach you"
God's Natural Order: Genesis or Job? The God of "All Flesh"
What Does Ecclesiastes Say about God? How Do We Decide What God is Like?